The Home Heartbeat was a monitoring system for your home’s vital signs. Introduced by Eaton Electrical, Inc. at the Consumer Electronic Show (CES) in Las Vegas during January of 2005. It was officially retired on June 1, 2011. Not to be confused with a home control system, the Home Heartbeat ostensibly provided status information about your house. Sensors could monitor doors/windows, movement, water leakage, and power consumption of plugged in appliances. Any trouble detected would be sent to a wireless key fob carried by the homeowner. If the home owner was out of range of the system (60-90 feet), these alerts would be sent via SMS or email. That’s about all there was to it. Now that Eaton has discontinued the product line, the remote notification support no longer works. The design relied on a message relay service provided by Eaton. The Home Heartbeat Base Station was plugged directly into your home phone line. When an alert condition arose, the Base Station would dial an Eaton phone number, give them the alert message, and Eaton would in turn send the message onto your cell phone or email account. This service could be incredibly useful if you were away from home, and you knew that if the front door had opened, that someone unwanted had entered. This could be augmented by motion detection sensors that could tell you in which rooms this person had been. However, this system falls down on its knees if your home has frequent visitors and family coming and going. Alerting your cell phone to all of these events serves little purpose except to drive up your text messaging bill. This system was not useful for tracking the movements of friendly people in the house, such as monitoring the safety of an elderly person living alone. What Eaton needed was an interface to the Internet so that the complete state of your home could be remotely monitored from a computer or smartphone. A couple of years later Eaton did introduce the Home Heartbeat Broadband Gateway with an Eaton provided monitoring service at $10 a month. Maybe this was just too little, and too late. The MSRP of the product line has been gathered from Internet sources. It is not known at what period during the product’s lifetime that these prices were valid. These prices may not be representative of initial product introduction, or product maturity. The idea behind the design was to use sensors based on the ZigBee IEEE standard 802.15.4 low-power wireless network. The advantage here was that ZigBee can run for years on battery power. This presented and ideal framework for development of a home monitoring system. I assume Eaton chose to do a monitoring-only system, because a home control system based on ZigBee would have drained batteries much too quickly. A monitored sensor is in a standby state, drawing little to no power, until an event occurs, such as a switch closure. Once awake, the sensor fires off a wireless message, informing the Base Station of the new status. The sensor then powers itself off, or into a dormant state. If Eaton had chose to implement a home control system, then each module/sensor would have to be awake and ready to receive messages at all times. This would drain the batteries much faster. The one exception to this is that they did produce an actuator that could turn off a water valve in the event that a leak was detected. They overcame the battery drain problem with this controller by requiring that it be plugged into an AC outlet. The Home Heartbeat sensor design was discrete only. Each sensor could only detect a change between two alternate states. The change between these two states is what served to wake the sensor up. Reminder Sensor Started Time’s Up! Other potential sensors, called analog sensors, such as reading current temperature, light level, water level or flow, or mechanical position would require numerical values to be transmitted to the Base Station. These types of sensors would require that frequent messages be sent to the Base Station, which would reduce battery life. This is the likely reason that Eaton chose to only develop discrete sensors. When restricted to discrete sensor technology, you can quickly exhaust the possible types of sensors that can be developed. The addition of the Reminder Sensor and the Attention Sensor to the product line are evidence of this problem. Neither sensor is really a sensor at all. Each is just a push button, wherein a person is saying “I pressed that”. Each sensor has a channel that accepts the Home Key for the purpose of adding the sensor into the existing home network. Each sensor channel contains a magnet and proximity switch as does the Home Key. When the Home Key is inserted into the channel, the magnets are aligned with the proximity switches in the opposing device, placing both devices into pairing mode. This design choice eliminates the pairing button commonly found on ZigBee nodes. The Home Key primarily exists for the purpose of adding (pairing) new sensors into the home network. The design augmented this functionality with additional features that are unrelated to pairing. It was intended that the homeowner would carry the Home Key at all times whether at home or away. In order to promote this idea, they designed a metal ring into one end so that you could attach your keys. As a key fob, the bulky Home Key could be carried in a purse, but it is unlikely to be comfortable if carried in a pocket. By encouraging you to take the Home Key with you, the Home Base could tell when you had left the house so that it could begin sending alerts to your cell phone. Sadly, once you were out of range of the Base Station, the Home key became a useless hunk of plastic. Eaton attempted to show that it was still useful while away from home, by saying that you could look up your sensors and see what state they were in when you left. Somehow knowing what the state of my house “was” at one point in time leaves me with little reassurance. 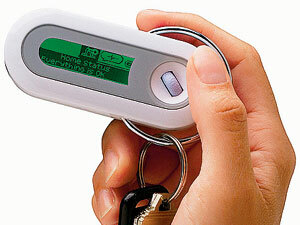 The Home Key acts as the user interface, and sole alert mechanism, while at home. Unless you carry it at all times while at home, the Home Heartbeat won’t be able to tell you that gypsies are robbing you while you lounge on the back porch. And for those of us over 40, having it with you without your reading glasses to read the minute text, will leave you unable to tell what caused the alert. I imagine that most people left the thing docked in the Base Station, rather than carry it around. The sensor housing is simple, clean and functional, with the exception of the vestigial antenna stub. Being that the actual antenna is a small chip on the circuit card, the dummy antenna serves only to placate the homeowner that this is indeed a wireless device. The front of each sensor has an easy access battery replacement cover. An apparent design afterthought was to place a piece of clear tape on one edge of the battery cover to act a a hinge in an apparent effort to simplify battery changing. The Base Station tries too hard to be stylish, with its reclined stature, and oval ring shaped base. Once again, there is this protrusion pretending to be antenna, where there is none. (It’s odd that the Home Key wasn’t designed with this faux antenna.) The Base Station includes three unlabeled LED indicator lights. Green, yellow, and red. Is this a traffic light? Must I refer to the user manual each time one is lit? The green LED is the power light, but flashes if the Home Key is charging. The red LED indicates an error condition. What was the error, and what do I do about it? The yellow LED is lit during communication across the USB port. The designers put a lot of effort into making the Home Heartbeat ambidextrous. The Home Key can be operated in either hand. The system decides whether you are left or right handed when you slide the Home Key into the Base Station. The LCD display will flip to the upright position, whether slid in from the left or the right. In addition, each of the sensors has a Home Key channel that can be approached from either the left or the right. It is too bad that with all of the technology crammed into the Home Key that the LCD screen wasn’t made large enough to be read by presbyopic persons. 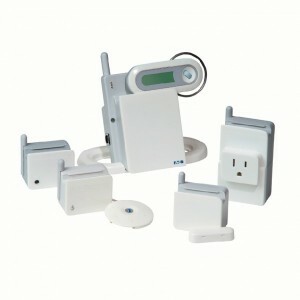 Billed by Eaton as “The World’s First Home Awareness System” in an attempt to create a new product category. This would place it squarely in between home control systems, and home security systems. It has the same home monitoring capability as a home security system without the ability to summon the police or emergency services. It may be aware of the home’s state, but it cannot react to conditions by turning on a light, or adjusting the thermostat when the family comes home. Engineering TV: from CES 2009, Dave Richards, Eaton’s Product Manager, gives us a walk-through of the system’s key components: the Base Station, the Home Key, and the sensors that keep the pulse of your home in check.